A mousseline sauce is a luxurious, light, smooth and very rich version of a classic Hollandaise sauce. However, the classic has a very generous helping of whipped cream carefully folded into it, making it just gorgeous. The mousseline is also called a Chantilly sauce, reminiscent of the favorite dessert sauce, Chantilly Cream because of the airy cream component. But these two should never be confused and are not substitutes for each other. The mousseline is for savory dishes, the Chantilly, sweet. So, perhaps best to skip the second description. Mousseline translates as muslin in French, and as this also describes a delicate, light cloth, which neatly sums up the texture needed. As a classic mousseline sauce is so light and airy, you need to think carefully about what to serve the sauce with; it will not hold up to strong, or heavy flavors or textures. The mousseline needs to be served with other equally delicate textured foods, like fish and eggs. The eggs used to make this sauce must be as fresh and possible and where possible use free range, preferably organic. They are not cooked for long in the recipe, so freshness is paramount. Place the three egg yolks and 2 tablespoons/30ml of the melted butter into a small saucepan. Using a small whisk, whisk the two together over a very low heat, do not rush this process or the eggs will scramble. Continue whisking the butter into this egg mixture, 2 teaspoons at a time, until all the butter is thoroughly incorporated into the sauce by which time, the sauce will be thick, smooth, and glossy. Do not rush this process, it cannot be done quickly, the key to success is to slowly, slowly and do not be tempted to raise the heat. 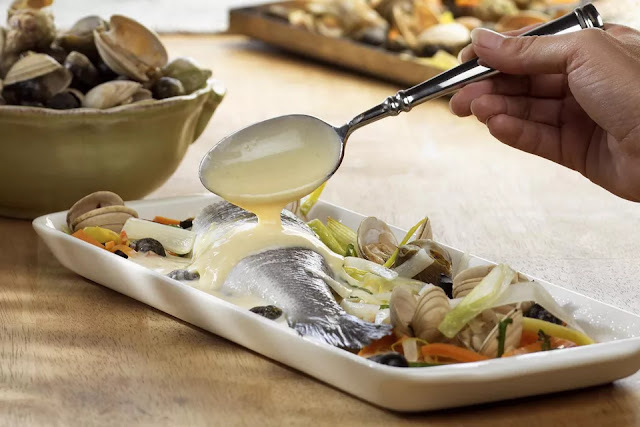 Whisk the lemon juice and salt into the resulting hollandaise sauce, and then continue stirring it for 1 minute longer to cook the sauce through. Whip the cream to light, soft peaks by hand or using an electric mixer making sure you do not overwhip. Remove the sauce from the heat, and using a metal tablespoon, gently fold (not stir or beat) in the unsweetened whipped cream. The lighter your touch here, the lighter the finished sauce will be. Serve immediately. Should you need to keep the sauce, it does not hold for long but is best set over a bowl of hot water with an occasional flick of the whisk to keep it holding the shape, but fifteen minutes is the maximum time. This mousseline sauce recipe makes 2 1/3 cups/580ml, or 16 servings, of sauce.